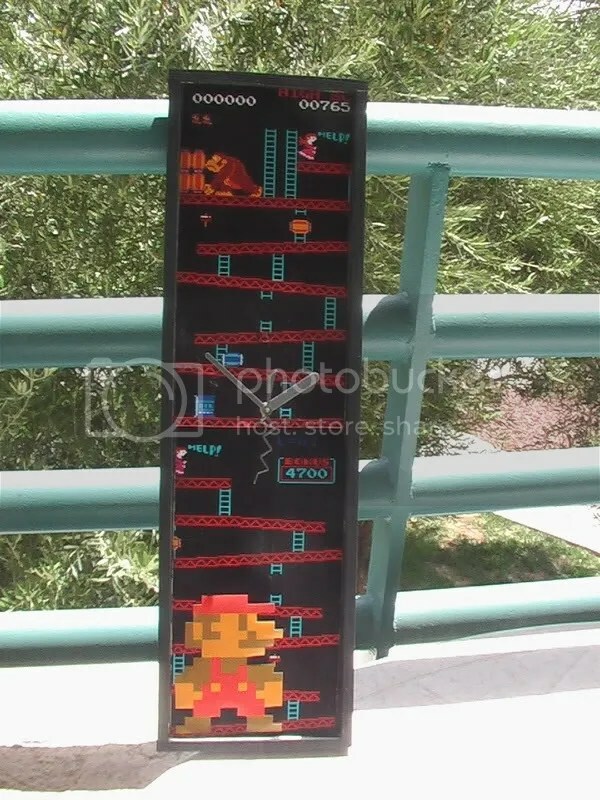 DIY Donkey Kong Clock for under $15 UPDATE! Better Pics! 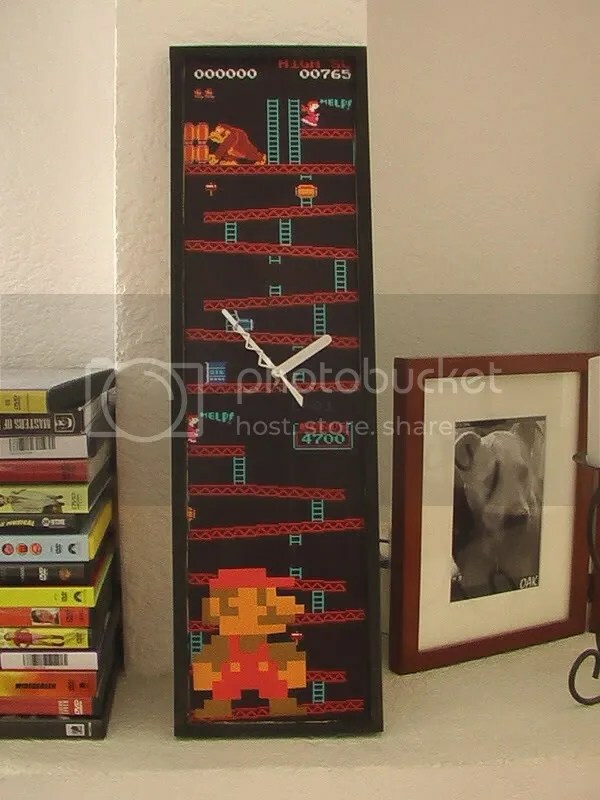 I kind of have this weird fetish for clocks…and Nintendo. 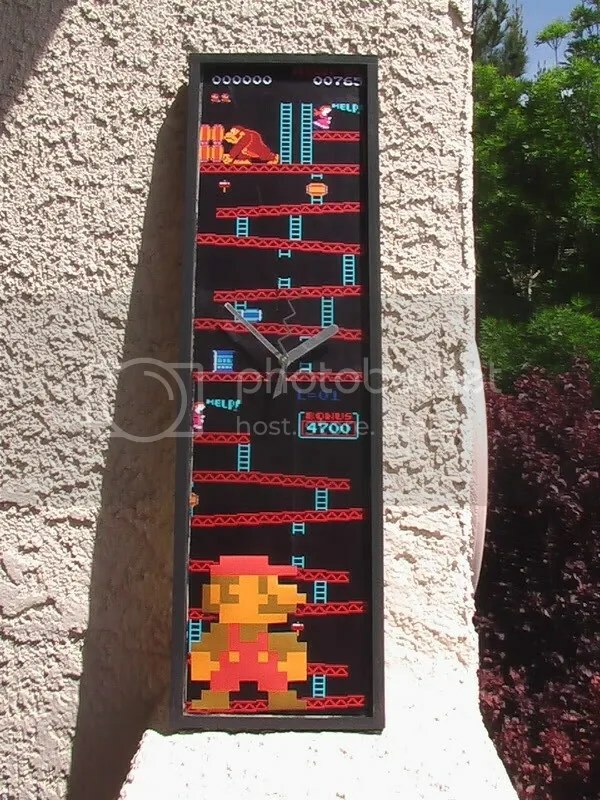 You can find Nintendo clocks at a lot of online retailers or if you happen to be in Japan. In the USA, notsomuch. So I decided to create my own Nintendo clock. I found all of the parts for the clock at a local craft store (Clockworks, wood frame, black paint, gluesicks and clear spray varnish. I first found the art I wanted and cut out the various images accordingly. After that I drilled a hole in the back of the frame for the clock itself. I painted the frame black, attached my images using a gluestick and the sprayed the entire thing with varnish. Finally, I installed the clock pieces. I did have to replace the actual hands included in the clock kit with some more “retro” looking ones. The whole project took me about an hour from start to finish and I’m really happy with the results. It’s an easy and cheap project that yields some great results. If any of you get the inkling to try it, send me pictures and I’ll post them! Oh, by the way, this is our 100th post! Yay! Good job man. That clock is f’ing awesome. Yeah man that clock is awesome! Well, making arrows from the fire stick would make it awsome. GJ!